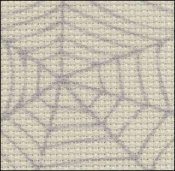 Cobweb Aida 14, Fabric Flair  - $66.00 : Yarn Tree, Your wholesale source for cross stitch supplies. Item 7834. Cobweb 14ct Aida. Creepy, crawly, what’s on the wall-y fabric for all your Halloween stitches. Grey cobwebs about 5” across on a dark cream background. Should be fun for a garden theme, too. In cuts 35”x39”.